As you all know it was my oldest son, Lucas’ 4th birthday on Christmas eve. We always try to make it extra special for him, there are so many other things going on, you know there’s the big red guy visiting that night, etc, etc. So when we were offered the chance to go to Build-A-Bear I jumped at the chance. I have taken Lucas there in the past and he loves it. This time however was extra special as he was old enough to appreciate it better. We arrived at the shop in Silverburn shopping centre and were met by the nicest member of staff ever called Mya. I could not have asked for a sweeter person. She gave Lucas and Tyler a sticker and talked him through the process. First he got to pick his bear. He picked a monkey. He loves monkeys, as his favourite show is Curious George always has been. Next he picked a sound for his monkey, and much to my surprise he picked the monkey sound. The stuffing came next. Lucas was so excited, he couldn’t keep the smile off his wee cute face. He got to press the pedal and stuff the monkey. He wasn’t keen on doing the kissing of the heart and rubbing him on his head, etc. He’s a big 4 now after all. He’s too big for kisses he tells me, when others are around. He blows them kisses instead. His mummy is still allowed to give him a kiss goodnight, thankfully. The still nameless monkey was stitched up and sent to the blow drying area to get fluffed up. Lucas loved this as he had been playing Build-a-bear on the DS that morning and this is his favourite part of the game. 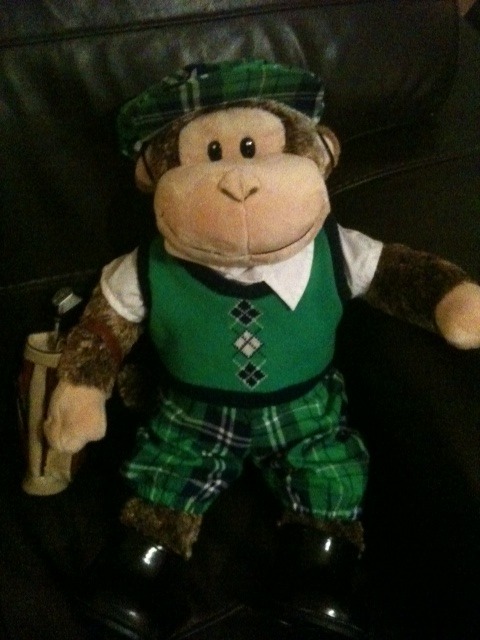 The monkey was given a name, no not George but Mario. Thank you Nintendo. So Mario was all soft and cuddly, the tests proved this. Now the hard part, picking out his outfit from the vast garments you can purchase for your bear. Lucas got a set of left handed golf clubs and a golf bag for his birthday. Yes real ones, smaller obviously but very cute all the same. He’s been desperate for golf lessons. So he chose a golf outfit for Mario. Not Buzz, not Woody or the Storm Trooper one which Tyler chose for his bear, (I think daddy may have had some influence on that one) but a golf outfit. Complete with boxers and shorts. Then came the choosing of shoes. He chose wellies, black wellies. It was his day after all. I tired, “How about these trainers?” or “What about these golf shoes?” Nope none of it. Wellies it was. So Mario got dressed in front of his own personal mirror, he was looking very handsome in his green golfing outfit, matching hat and golf bag and clubs accessories, until you got to the shoes. Hey, ho it was his choice. We got him all registered with his very own birth certificate and his own box to get carried home in. Of course he was only in the box, until we left the shop. Then the best bit came, Mya rang a bell and got everyone in the shops attention. She told the shop it was a special person’s birthday and got everyone to sing happy birthday to him. I had tears in my eyes. If it had been me standing there, I would have crawled under a table, but my baby boy stood there proud with a huge smile on his face loving every minute of it. Now that made my day. Here is Mario, who never leaves Lucas’ side for long. We now have several outfits to add to his collection. You see what I mean about the wellies? Thank you so much to Estelle and Build-a-Bear for giving my little boy a birthday to remember. I know I will always remember how ecstatic he was. I would recommend Build-a-bear to everyone young and old, male or female, they have something for all. I will be taking my youngest there for his birthday on Friday. How cool is that?!! Sounds like you had a fab time! Chick is desperate to go to build-a-bear but I told her that she has to wait until her birthday in November!!! Aww this was so cute! I finally went to Build-a-Bear when I was like 18 and it was so much fun! Definitely a must-have childhood experience! Happy Birthday to your boys! Build-A-Bear Workshop is FANTASTIC. I love that shop and my boys love that shop. Excellent customer service and focus everytime we walk in. Mario is SO cute. Even with those wellies! Such a brilliant post. Has made me want to go even more. Sounds like Lucas really enjoyed himself and I LOVE Mario. I had spotted the monkey before and thought how super cute it is!